This weather is crazy compared to last year. There hasn’t been a day in the last month that I haven’t needed my big winter jacket. The weather has stayed so cold for so long and now the hedgehog has predicted another six weeks of winter! Because of the amount of snow yesterday there was a snow day!! Hello three day weekend!! 🙂 I spent the day sleeping, catching up on homework and building a fort! 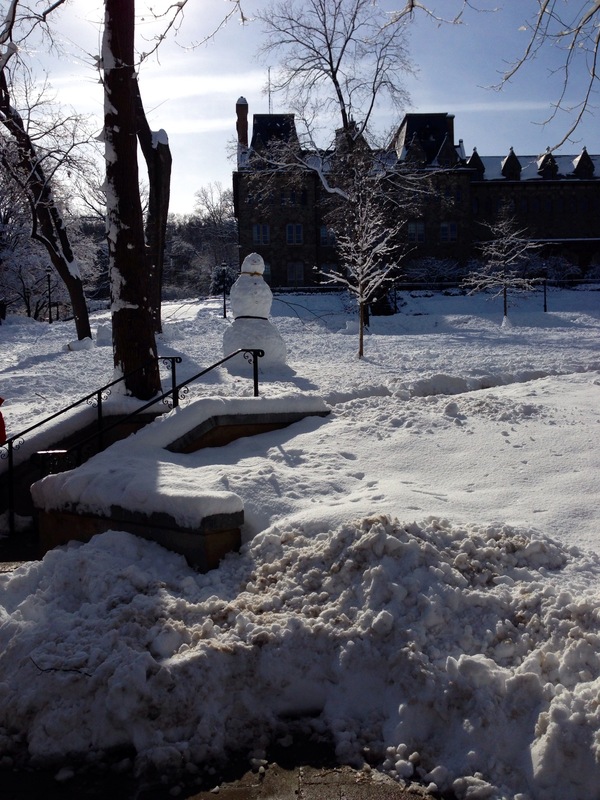 Above is a picture of a snowman someone else at Lehigh made, but collectively I’d say the campus was excited to take a little time away from work and play outside. The fraternity next to my house went so far as to build an igloo. I think I saw a plow about to run over the fort this morning… which was unfortunate, but there’s a chance of another big storm tonight and tomorrow, though! The downside to this though, is that although homework deadlines can be delayed–some of my big projects are still due on the same time and I’m still procrastinating those.